1 . Cut the cabbage in bite size . Place in the large bowl , sprinkle with salt , and toss with hands until the cabbage is coated .add enough cold water to just cover ( about 12 cups), making sure the cabbage is submerged . Cover with plastic wrap and let sit at room temperature at least 12 hours and up to 24 hours. 3. Place the remaining ingredients in a large bowl and stir them together. Add the cabbage and toss with your hands until evenly combined and the cabbage is thoroughly coated with the mixture. Pack the mixture tightly into a clean 2 quart glass jar with the lid and seal the jar. 4. Let it in a cool, dark place for 24 hours, the mixture of cabbages may bubble. Open the jar time time to time to let the gases escape from jar and refrigerate at least 48 hours before eating . 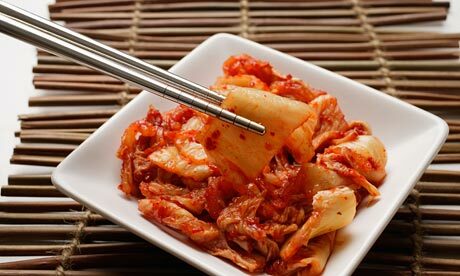 Kimchi is best after few days.